Soccer Study: Seattle Times reporter Jayda Evans is pulling the curtain back for a look at what she’s learning in her first year on the Sounders beat. By chronicling her access, exploration and explanation, we hope you may learn something in the process, too. Talk of beauty pageants isn’t how Garth Lagerwey expected to spend a Wednesday afternoon. 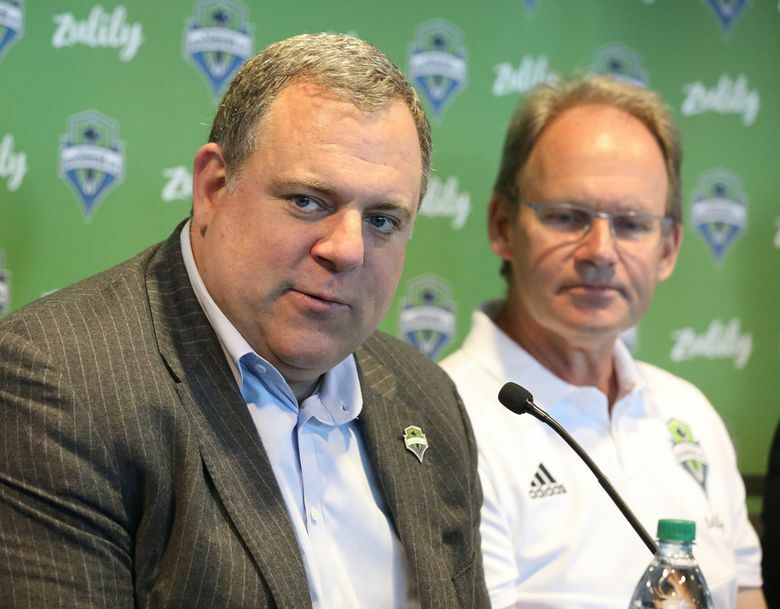 The Sounders general manager welcomes anyone with questions about the sport he loves and in which he once starred as a goalkeeper in MLS’ early years. But equating soccer to pageants? “That’s interesting,” Lagerwey told me in his corner office at Starfire Sports in Tukwila, where the Sounders practice. There’s laughter at the odd bridge we built to spark a conversation about soccer to deepen my knowledge. And that’s the idea with this series as I take over the Sounders beat for The Seattle Times. Through the season, I’ll pull aside and learn a little more about a topic from those directly involved in the game and share those tales with you. Seattle University men’s soccer coach Pete Fewing, a longtime Seattle Times subscriber and Sounders broadcaster, was among the people I met at practice who said he enjoys my writing — which for the past two decades has primarily been about basketball. While I’ve written a few soccer articles through the years, I don’t want to act like my spot coverage is astute beat reporting. So I have lots of questions, beginning with winning and trophies. Soccer has my eyes twinkling at how in a calendar year, a team could collect a gaudy amount of bling that has undebatable meaning. That’s similar to beauty pageants, where a contestant typically has to win a local competition to advance to the state title, then qualify for Miss USA and win there to compete for Miss Universe. Of course, Lagerwey hadn’t thought of it that way before, but after a moment, he confirmed there’s a similar path the Sounders could take in winning the MLS Cup, then CONCACAF Champions League and advancing to the FIFA Club World Cup, where seven regional champions converge for a true global title. No MLS team has done that. Beginning play in 1996, the league is now advancing at a rapid pace to try to compete on that elite level, where Real Madrid is the gold standard. The team won its fourth FIFA Club World Cup last year. The Sounders, whose meshed history from various leagues stretches back to 1974, are working on MLS dominance. With five players worthy of call-ups to play for their national teams during the current international break, Seattle is already off to its best start in a decade at 3-0-0. In watching the team play, I can’t shake the parallels between soccer and basketball. I mean, Sounders winger Victor Rodriguez’s move in the second half of the team’s win against Chicago this month was a wicked crossover that would make Allen Iverson smile. But would describing it that way irritate a soccer fan? Fears of using my experience in basketball to relate to soccer vanished when I walked into the Sounders’ team cafeteria Thursday and every big screen was tuned to broadcasts of the NCAA men’s basketball tournament. Sounders defender Brad Smith even filled out a bracket this year. Honestly, this change couldn’t come at a better time for me because my alma mater, the University of Arizona, failed to get a men’s basketball postseason tournament berth for the first time since 2010. I’m happy to dismiss March Madness and never pick up a ball again — because it’s a violation in my new sport of soccer.